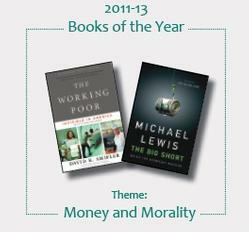 2011-2013 Books of the Year: "Money and Morality"
The UAA/APU Books of the Year program is a powerful partnership that brings faculty, staff, and community members together to understand common themes. The books serve as the catalyst for discussions of larger issues of local and international significance. 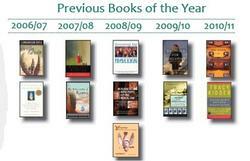 The Books of the Year program started in 2006 as part of a Ford Foundation Difficult Dialogues initiative -- one of only 26 in the country -- to provide a safe environment on campuses for discussions of challenging topics. UAA and APU are now national leaders in this area. Because of its Difficult Dialogues beginnings, the UAA/APU program is different than other university common reading programs. Its goal is to select books that provoke serious discussion about serious issues, rather than providing "introduction to college" exercises or a freshman class bonding experience. Based on a general theme, the faculty select two books that encourage in-depth discussion of challenging or multifaceted topics. The associated programming encourages readers to explore the theme, not just the books, and provide creative venues and forums for people to express their interpretations in different ways. 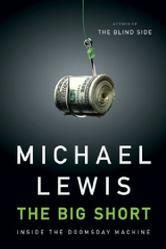 Michael Lewis on "60 Minutes"
Michael Lewis on "The Daily Show"
Michael Lewis on "Charlie Rose"
Michael Lewis on "Fresh Air"
Keynote lectures by featured authors. Past lecturers include T.C. Boyle, Byron Mallott, Seth Kantner, and Charles Wohlforth. A public debate by the internationally award-winning Seawolf Debate Team, related to Books of the Year themes. Community forums and panel discussions, where people can exchange stories, insights, and reflections about the books. 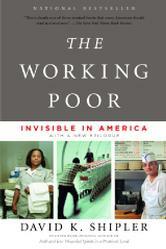 For more information, visit the UAA Books of the Year Web Site.